(CNN) -- Germany's Maria Riesch claimed her first gold at a world championships in a dramatic finale to women's competition at Val d'Isere on Saturday. 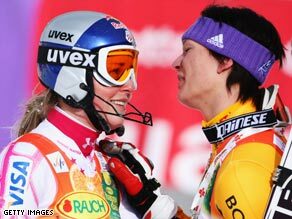 Vonn (left) and Riesch embrace after the German claimed gold in Val d'Isere. Riesch made no mistake in her specialist slalom discipline to make it two straight wins for Germany after Kathrin Hoetzl took the giant slalom on Thursday. But she needed mistakes from double gold medallist and her best friend Lindsey Vonn and first leg leader Manuela Moelgg of Italy before securing a popular victory. Riesch, only sixth fastest after the first leg, mastered the treacherous Bellevarde piste on her second run for a combined time of one minute 51.80 seconds. Defending champion Sarka Zahrobska of the Czech Republic and Finland's Tanja Poutianen produced solid runs, but could not threaten Riesch's time. But Vonn, bidding for her third gold medal at the championships, was surely a threat despite skiing with a heavily-bandaged right hand after cutting her thumb in a champagne celebration. Riesch put her hand to her mouth in disbelief but Moelgg had a considerable first run advantage and was ahead at the first two checkpoints. With the finish in sight, the pressure proved too much for the Italian who straddled a gate and could not recover. Zahrobska was left to claim silver with Poutianen taking a surprise bronze. The top two from the first run were not the only skiers to come to grief with home hopes ended as Sandrine Aubert, who was third after the first leg, also made a big mistake to end her hopes. Attention now turns to compatriot Jean Baptiste Grange as he bids for gold in the men's slalom on the final day of the championships on Sunday.